It doesn’t get any better than this! This is a bona fide must-have acquisition for any veritable Star Wars aficionado. It will become the centerpiece of your collection. Taken from the exhilarating escape scene in Star Wars: A New Hope, this astounding Millennium Falcon resin statue is perfectly cast down to the very finest detail. 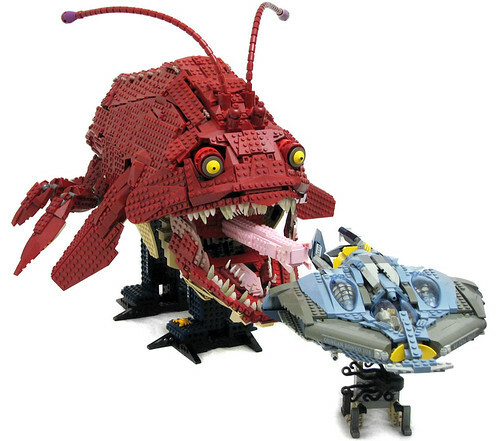 The entire piece measures an incredible 17 1/2-inches tall x 26 1/2-inches wide x 68-inches long! 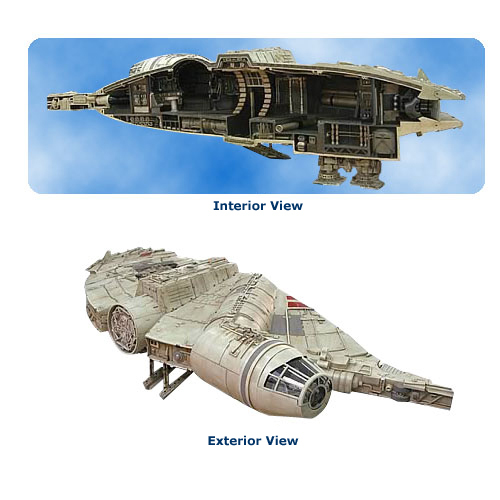 Truly a unique collector’s item, one half of the Millennium Falcon is displayed while the other half provides an amazing open view of the inside of the vessel. Don’t let this one get away! Limited edition of 400 pieces. Character statues shown in the images are sold separately and not included. As an added bonus, a small metal figurine of a Mouse Droid can be obtained by mailing in a completed form to the manufacturer. You would think that for a product that’s over $2,400 they could include the mouse droid. so I guess they’re going to just forget that there were no jedi left after the purge until Luke? They mention twerking, but there’s actually no twerking going on here. sad. 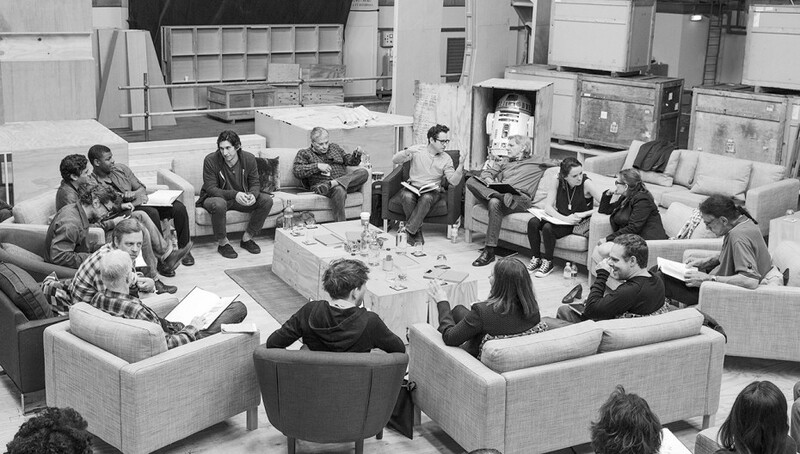 Star Wars: Episode VII is being directed by J.J. Abrams from a screenplay by Lawrence Kasdan and Abrams. Kathleen Kennedy, J.J. Abrams, and Bryan Burk are producing, and John Williams returns as the composer. The movie opens worldwide on December 18, 2015. Is that a black man in the corner? Goodness! Let’s hope it’s a little more multicultural than just a single guy from a race that isn’t white. 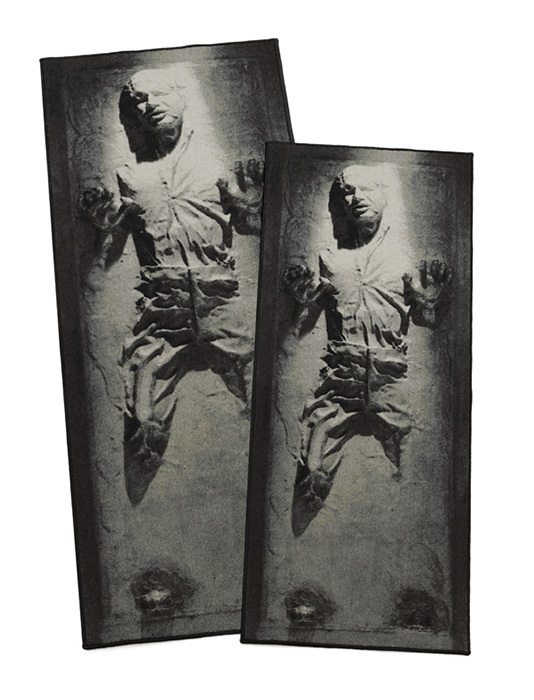 Because of how human bodies work, these highly-detailed Han Solo rugs are a great size to be a hallway runner, letting all who enter your abode know you are not to be trifled with. (And also that you’re a huge Star Wars fan.) Line the sides of the hallway with “torches” made from lightsabers, and you’ve got the ultimate entryway for your geek pad. Make your doorbell play Imperial March for the pièce de résistance.